LONDON: Mohamed Salah was Liverpool’s hero yet again as the Egypt star clinched a dramatic 2-1 win at Crystal Palace, while Alexis Sanchez ended his Manchester United goal drought in a 2-0 victory over Swansea yesterday. Despite the huge Champions League quarter-final first leg against Manchester City looming on Wednesday, Liverpool boss Jurgen Klopp named his strongest side for the Premier League trip to south London. Luka Milivojevic drove struggling Palace into a 13th minute lead from the penalty spot after Loris Karius fouled Wilfried Zaha. But Senegal winger Sadio Mane levelled four minutes after the break with a close-range finish. Despite having one of his quieter games of an incredible debut season at Liverpool, Salah proved the match winner as he smashed home in the 84th minute. Salah, who has 37 goals in 42 games in all competitions this term, has scored in the joint-most Premier League matches (21) in a single 38-match season. That ties the mark set by Robin van Persie in 2012-13 and Cristiano Ronaldo in 2007-08. “I think the moment you see it is Mo (on the ball) you feel good. It was a very cool finish and long may that form continue,” Klopp said. “It is usual for us that we need to fight here, especially after a difficult start, but it makes it more special at the end.” Liverpool were unable to hold onto second place as United moved two points ahead of them at Old Trafford. Following on from his recent 12-minute press conference rant in defence of his reign, United manager Jose Mourinho wrote in his programme notes that United are a club “in a moment of transition”. United responded to Mourinho’s words as out-of-form midfielder Paul Pogba returned for the first time in four matches. 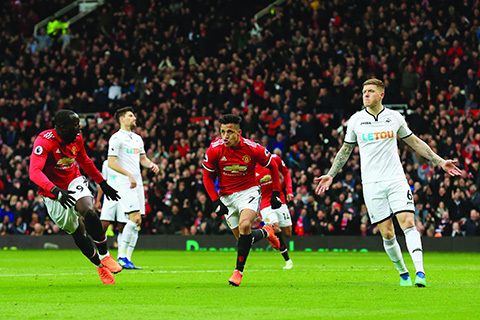 Romelu Lukaku scored for United with a deflected strike from Sanchez’s pass in the fifth minute. Former Chelsea and Everton star Lukaku, who has netted in five times in his last six appearances, now has 100 career Premier League goals. Chile forward Sanchez bagged just his second goal since joining United from Arsenal in January in the 20th minute. The Premier League’s highest paid player had gone seven games without a goal until he finished off Jesse Lingard’s pass. Later Saturday, Manchester City can restore their 16-point lead with victory at Everton which would then set up the chance to wrap up the title by defeating United next weekend. Marko Arnautovic lifted the gloom at West Ham as his double inspired a crucial 3-0 victory against relegation rivals Southampton. Hundreds of fans staged a march against West Ham’s co-owners David Gold and David Sullivan before kick-off in the aftermath of the crowd protests that marred their recent home defeat against Burnley. Amid a tense atmosphere that saw extra security measures to protect the owners, on-loan Inter Milan midfielder Joao Mario eased the anxiety with a 13th minute opener for David Moyes’ side.